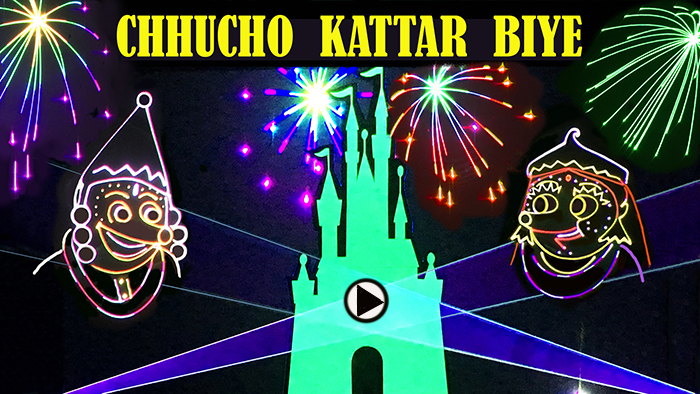 "Chhucho Kattar Biye" (Wedding of the Mole Leader), the hit song of Piya Sorcar, presented in laser animation, is on YouTube!!! It is one of the several songs of Piya from the popular album "Chhucho Kattar Biye" that also contains other songs by her sister, Payal. The album was the result of Manick and Shikha Sorcar's efforts to keep their US-born daughters attached to their Bengali (Indian) culture. 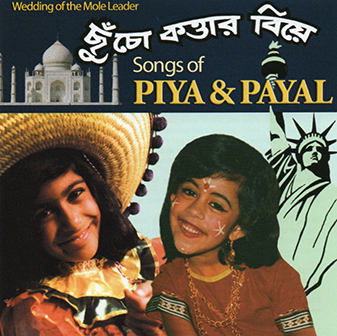 Front cover (Left) and Back cover (Right) of the popular CD "Chhucho Kattar Biye: Songs of Piya & Payal"
This was during the mid-eighties, when Piya was at a tender age of 8, and Payal, 5. Music composed by Manick Sorcar with lyrics-help from his wife Shikha, the songs were first released in cassettes and 45 rpm records in India and the United States, where they became instantly popular. In the US, the singers received First Place awards at the "Stars of Tomorrow" contest of the International Kiwanis Club, and in 1986, they were a part of "East Meets West", a half-hour TV special of the American Cablevision. In the same year the sisters also partcipated in a family program organized and telecast by Doordarshan, Kolkata, India. In 2007, 'Chhucho Kattar Biye' was one of the four songs in Manick Sorcar's laser show "LASERTOONS" displayed at the famous Nicco Park, Kolkata, where it ran packed-house, non-stop, completing a record 78 shows in a month with multiple displays a day to meet the demand. 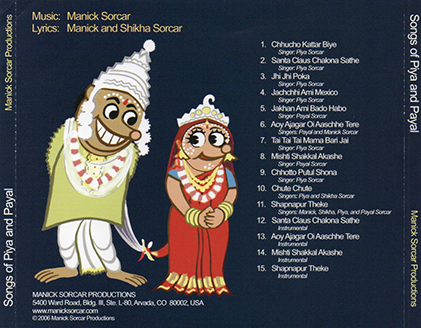 The songs are now available on a CD (shown above) from online and Manick Sorcar Productions. To listen to the song and watch the laser show, click YouTube , Facebook, or the picture at the top!